Techfest Munich is the first major hackathon I have been to with a biology lab automation track. AstraZeneca, the big pharma company, is hosting the track with the goal of spurring innovative ideas for the automated labs of the future. The event is in the beautiful Munich Makerspace and has been an amazing coming together of biologists and hacker engineers. 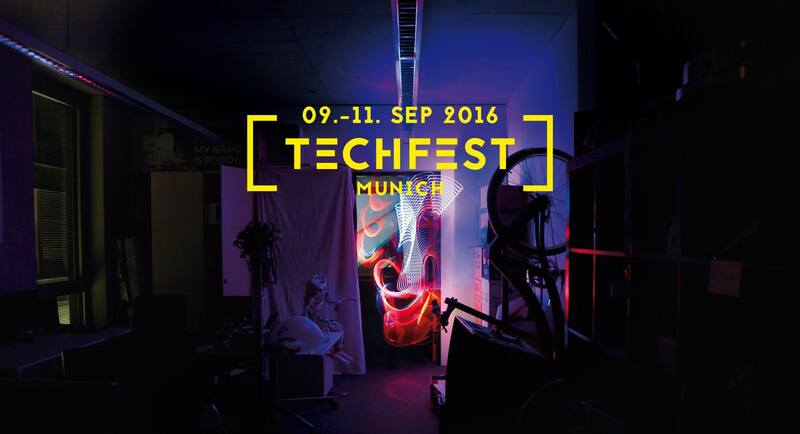 The event is being organized by two of the movers-and-shakers of the German Biohacker scene, Jerome and Rudigger. That's Jerome explaining all the projects to some newcomers looking to join in on the fun. He is a software engineer turned biohacker and runs both the synthetic biology meet-up in Munich and a vibrant European biohacker slack community. He's the super-friendly super-connector that invited me to Munich and brought the whole event together. Ruddiger literally wrote the book on German biohacking. He's also the maker of Generic Lab Equipment that that any biohacker can afford to buy or build, and the revolutionary OpenDrop digital microfluidics platform. As he is explaining in the slide above, flexible microfluidics platforms like the OpenDrop will be the next step after Opentrons in a 'Moore's Law like' acceleration in lab automation (automated liquid transfers becoming cheaper and smaller at an exponential rate). The OpenDrop works by floating tiny droplets with high voltage. It moves the droplets around to mix them and carry out biological protocols. Prototypes are available for the capable and brave (beware high voltage!). We also had two Opentrons at the event, one belonging to Ruddiger and the other to NanoTemper. The challenge AstraZeneca presented for the hackers was to manipulate various materials and dream up the next generation of lab automation techniques. Two of the teams focused on applications for the Opentrons to do just that. Team AlphaZ focused on creating closed loop solution optimization for the drug discovery process. They developed software from scratch to transfer liquid on the OT-One into a customized tube with electrodes in it. The two wires inside the tube allow them to measure the conductivity of the fluid inside, which varies with its chemical composition (in this case, salt content). In this way, they can modify any fluid's chemistry to optimize for the desired conductivity by add more salt or diluting it away with the OT-One. By continually measuring the conductivity and running an algorithm to determine what chemical steps need to take place, then instructing the OT-One to do them, they can create the exact solution they want. Salinity / conductivity is just one easy-to-prototype chemical characteristic, but you can see how this closed-loop optimization concept could be applied to any chemical characteristic you have a sensor to measure live. Their academic expertise is in machine learning, and team AlphaZ plan on running the different dilution curves through various optimization algorithms to train the OT-One to make faster solution optimization patterns. Team Two-Phase worked on automating phase separation with computer vision. The challenge, done by scientists manually in labs around the world, is removing part of a solution when it is divided in two phases. When two solutions repel each other (like oil and water) and have settled, one is floating on top of the other. This creates a distinct visual separation line. Using computer vision, team Two-Phase are able to detect this line. Because they know the volume of the tube, they can infer how much solution volume is on either side of the phase separation, and thus how much liquid the Opentron needs to remove from the top phase. As you can see below, graphs from the vision algorithm show obvious spike where separation line is, making it easily recognizable. By attaching the camera to a moving stage they are able to survey many tubes per run and tell the Opentron how much liquid to remove for each one, creating a high-throughput two-phase separation workflow. This was an amazing hackathon. The two teams working on the Opentrons showed that our dream of an easily customizable platform for creating novel lab automation workflows is real. These teams of engineers and designers had hardly any experience with lab processes before. But after interviewing the scientists at AstraZeneca to learn their needs, they were able to quickly implement useful, novel protocols using their own sensors and input algorithms on the OT-One. This is just the beginning of what I know will be a huge wave of open-source collaboration, and we will be focusing on helping these innovations on our platform merge into the main product and become available for all of our customers.